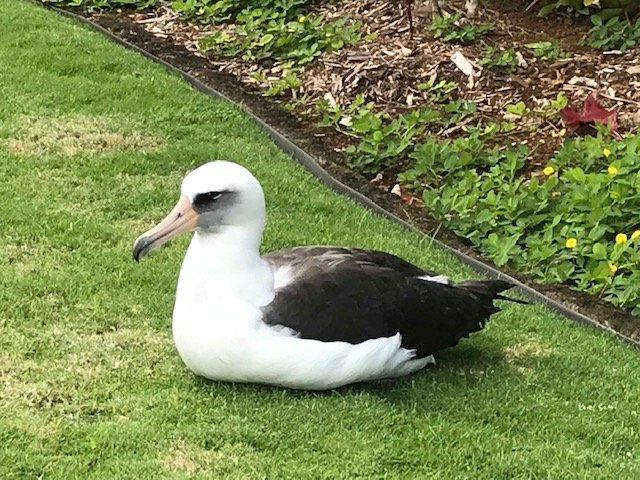 You know how excited I get when the Laysan albatross arrive back on Kaweonui Road in Princeville. For the last couple of weeks partners who have not seen each other for months are reuniting and it is a happy scene. There is lots of preening and affection happening up and down the street. The couples are deciding on the perfect spot for their nest and then starting its construction. Females are laying their eggs (one per bird) while the males take one last period at sea before having the first, long sit on the egg. From that point on, the two partners take turns on the egg while the other flies a thousand miles for food. Meet Dora. She arrived first this year and patiently waited until Larry showed up. Together they decided to nest in the cul-de-sac at the foot of Honu Point’s driveway. I captured this short video of Dora as she started to build a nest around herself just one day before she laid her egg (one of the landscapers witnessed the event). Larry is at sea for a few days. When he takes over Dora will be off to find food. If this egg is fertile we can expect a chick the fourth week of January. In the meantime Dora seems pretty content. Young albatross are also arriving on Kaweonui Road. After fledglings leave their nest they stay out to sea for three to four years. After that, assuming they stay safe, they come back to where they were born. Finding the perfect partner requires knowledge of the courtship dance. It is quite elaborate as you can see from this video taken right in Princeville a few years ago. Staying in the neighborhood and watching the daily activities of the Laysan albatross is quite entertaining. My last guest sent me a text saying, “I’ve become obsessed with these birds.” I totally understand. You may always check out our availability on our “Calendar and Rates” page. For more of my blogs or to subscribe, go to the right-hand side of this page (full screen computers). For more photos and information about Honu Point, go to the “Home” page of this website. Mahalo! 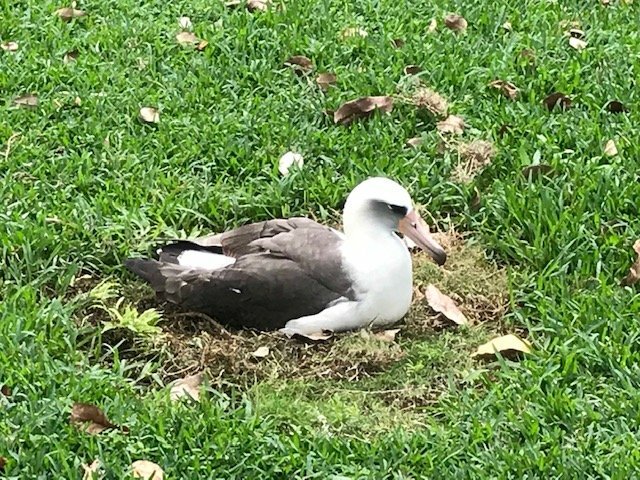 For albatross photos by Hob Osterlund, check out the Facebook page, Kauai Albatross Network.